In the Long Gallery of the Castle Museum and Art Gallery in Nottingham are two oil paintings that seem to speak to each other on the wall they share. They look similar – both use the formula horse-man-dog – but on inspection they seem very different in tone and implicit narrative. 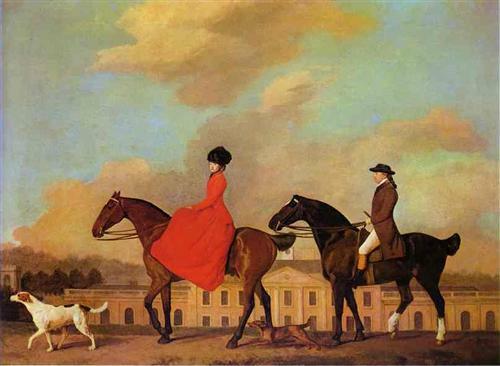 The earlier of the two is by George Stubbs, one of the finest painters of the eighteenth century. 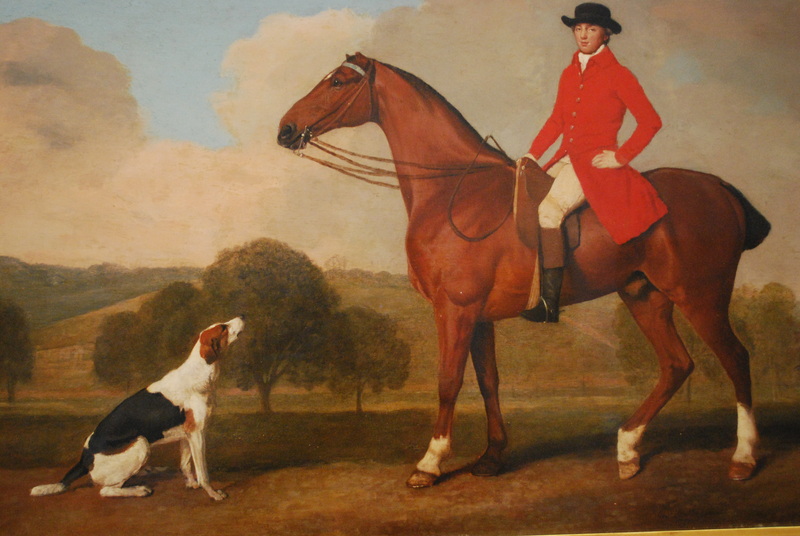 The oil painting, till recently in private hands, was allocated to the Museum in 2013 by the Acceptance in Lieu Panel, and is entitled Equestrian portrait of John Musters on his favourite hunter, Pilgrim, in the park at Colwick [the Museum calls the horse ‘Monarch’]. Its subject is John Musters, aged 24, owner of Colwick Hall near Nottingham. He’d inherited the Hall from his father, Munday Musters. John Carr, the York architect, had just finished remodelling the Hall for him, in the Palladian style. It was not Musters’ only recent acquisition. The year before he’d married Sophia, co-heir of another wealthy squire, James Modyford Heywood of Maristow, Devon. A third reason to be pleased was that in the same year, 1777, he’d been appointed High Sheriff of Nottinghamshire. The only mild disappointment was his failure to be elected as a Tory MP for the area. 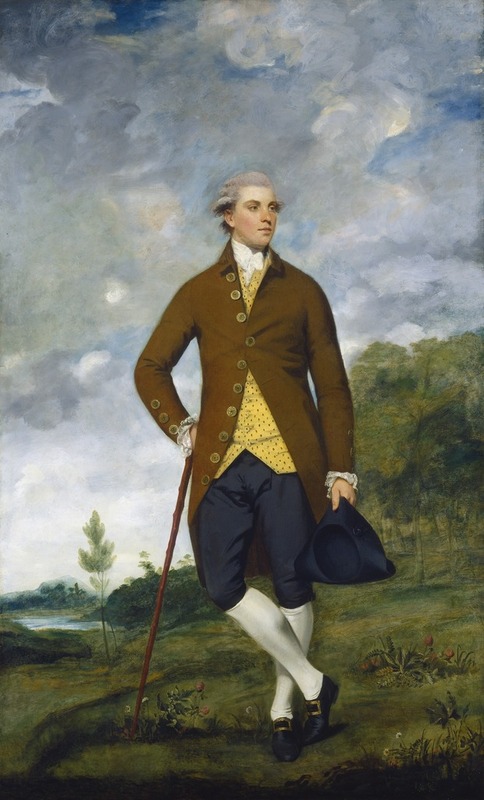 Stubbs already enjoyed a national reputation when the wealthy Musters commissioned him. The two seemed well-suited to each other. Stubbs had researched and published his pioneering horse anatomy studies and had painted some of his masterpieces, such as Gimcrack on Newmarket Heath and Whistlejacket. Musters was devoted to hunting (he kept a famous pack of hounds and was Master of the South Nottinghamshire Hunt) and racing (he owned several racehorses). Horses were his thing. Stubbs paints the young squire atop his favourite chestnut horse, ‘Pilgrim’. The horse, shown in perfect profile, could not be more handsome. He holds his head in equipoise. His coat shines from the recent attentions of his expert, but unseen, groom. He stands quietly, but with a hint of movement, completed or imminent, in his back feet. He carries no surplus weight, and his leg muscles, well understood by the master of equine anatomy, are powerful but well toned – he’s a swift runner. His saddle, its colour very close to that of his coat, gleams modestly. In short, Pilgrim is an equine vision, enfleshed in paint by the greatest artistic observer and celebrant of the horse. Facing the horse and its rider is another prize animal: a single alert foxhound, half sitting, half standing. Its body makes almost a perfect triangle, in contrast to the oblong form of horse and rider – Stubbs always took great care with his formal composition. He appears taut and ready for an order to rapid action, in contrast to the serene horse. Musters himself is as collected and self-possessed as his animals. He sits formally but easily in the saddle, his back straight, one hand on the reins, the other on his left thigh. This off-centre pose allows him to turn and gaze confidently directly out at us. His dress is modest and simple, but striking and beautifully made: a broad brimmed black hat, skin-tight breeches and stockings, medium length boots, and a riding coat of the most brilliant scarlet, a badge of Musters’ good breeding and social distinction. Behind the three figures is the pastoral landscaped estate of Colwick Hall. The settings and the figures – and of course the genius of George Stubbs – paint a picture of a world in balance, a gentlemanly idyll of peace, order and contentment. It was an image so beguiling that John Musters commissioned six other pictures from Stubbs around the same time (1777-78). By far the most striking is a double portrait of John and his new wife Sophia. The picture takes the form of a mounted procession, with dogs, before the facade of the newly enlarged Colwick Hall. It’s striking because this time it’s Sophia who catches the eye. She leads the way and occupies a much larger space than her husband. The brilliant scarlet is now hers – a full-length riding cloak, magnified by the fact that she’s side-saddle and therefore turned towards us. And it’s she who faces us, with an imperious look and a fashionably luxuriant black hat. John follows on, rather sheepishly, his gaze fixed on Sophia. This second picture is less harmonious and more troubling than the first. It contains the seeds of the misfortunes that were to follow. Sophia swiftly produced four children in Colwick Hall, and the necessary heir. But while John was content with his Nottinghamshire home she yearned for the more cosmopolitan pleasures of London and Brighton, and probably more entertaining company than her husband’s. She was widely known for her beauty. Fanny Burney described her as ‘an exceedingly pretty woman, who is the reigning toast of the season’. She turned the heads of many men of fashion, including, it was rumoured, the Prince of Wales. Portrait painters queued to capture her looks: George Romney, John Hoppner and (another rumoured admirer) Sir Joshua Reynolds, who painted no fewer than four pictures, including a notably voluptuous Sophia as Hebe, cupbearer of the Greek gods. ‘Most beautiful, but most unhappy’ was another of Fanny Burney’s phrases for her. She was not the only unhappy one. It seems that John Musters finally lost patience with her infidelities. He had her painted out of the double portrait (Sophia was returned to it only on its restoration in 1936). As Judy Egerton comments, ‘… a certain amount of over-painting later proved necessary to paper over the cracks in the marriage.’ Musters also painted Sophia out of another double portrait by Stubbs, where her figure was replaced with the image of Rev. Philip Story, a clerical crony of Musters. Despite this artistic damnatio memoriae Musters seems not to have forgotten Sophia or held a grudge against her, and when she died in 1819, aged 61, he paid for a lavish memorial to her, designed by Richard Westmacott and now in the church of All Saints, Annesley. Here Sophia appears less as vamp and more as Madonna. The inscription fails to refer to her wayward past: ‘if truth, if goodness, charity and grace can in Heaven’s holy record find a place thy name, Sophia, with an angel’s pen is traced on leaves of bliss by saintly men’. John Musters died in London on 23 February 1827. 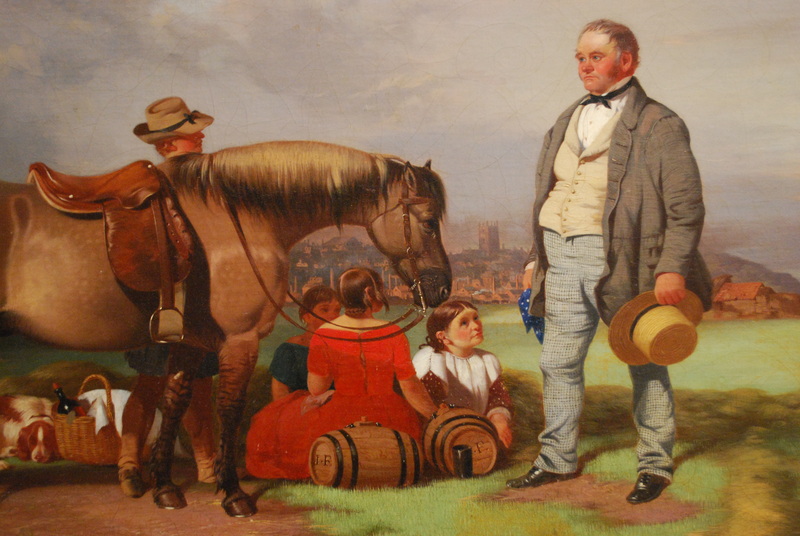 The second Nottingham horse-man-dog portrait, Joseph Fenton with his family in the Meadows, Nottingham, 23 August 1840, was painted 63 years later. By comparison with the first both artist and subject are obscure, and little is known about either. The painter doesn’t appear in even the most detailed dictionaries of Victorian artists. His name is William Malbon. He was born in Nottingham in 1809 (sometimes the date is given in error as 1805), but later worked mainly in the Sheffield area, where he died, a pauper, in 1877 (his address then was Pear Street West, Ecclesall). He appears to have worked in the same tradition as Stubbs. His environment is rural, and his subjects include horses, cattle, dogs and genre scenes. Though his name was forgotten, many of his paintings survived. Some are in public collections in Nottingham, Sheffield and Hull, while others regularly sell at auction for over £1,000. Joseph Fenton was the publican of the Black Boy Inn and Coach House in Nottingham (the picture was kept there until the pub was demolished in 1969). At the time of the painting he was 49 years old, his wife Ann was 44 and his daughter Elizabeth 19. We’re at a picnic, a much less formal scene than Stubbs’s. At the right stands Fenton, in paterfamilias role, corpulent, red-cheeked and satisfied. It would be possible to guess that he was an innkeeper, even without noticing that the two beer barrels at his feet are stamped ‘JF’. He’s wearing his Sunday best: chequered trousers whose hems trail over his black shoes, a white shirt and black neck tie covered by a beige waistcoat and a jacket that’s seen better days – it’s crumpled and worn, and its left sleeve is beginning to come detached at the shoulder (perhaps his margins on beer sales are small). In his right hand he holds a blue cloth with white dots, and in the other a boating hat. He’s looking towards a boy, possibly a groom, whose figure is largely concealed by the flank of a submissive looking horse. The horse dominates the picture, as a symbol of material substance and good fortune, in the same way as Stubbs’s horse. Below, sitting on the grass, are three girls waiting to start the picnic: Elizabeth and two friends, perhaps (none looks old enough to be Ann). Between the horse’s legs we can see the picnic basket, complete with wine bottle (who on earth is going to consume all the alcohol? ), and a dog, asleep, its head leaning on the basket. We can see the fresh faces of two of the girls; the other, older one has our back to us: she attracts most attention, since she’s wearing a scarlet dress. All three direct their expectant attention towards Fenton. The setting for the picnic is The Meadows, an area of open fields south of the city near the river Trent (the Castle can be seen on the far left, and the city centre lies beyond the horse’s head). It was common ground, shared by many residents and open to all – very different from the exclusive estate belonging to John Musters. In the 1840s, under pressure from the increasing population of the industrialised city, the Nottingham commons were enclosed, despite much opposition. Our picture gives one of the last views of The Meadows before they were built over and it became difficult to lead your horse and family across the river for a Sunday picnic in the sunny fields. The two paintings share a common artistic language, and common motifs. But otherwise they’re far apart. Stubbs, while more than happy to undertake Musters’ commission and paint the squire in the required light, is more interested, you feel, in the horse than the human. As so often, he’s absorbed – obsessed – with the horsiness of the horse: its form and sheen, its skeletal frame and its musculature, its dignity and spirit. The dog, too, is studied carefully and lovingly for its dogginess. When he reaches Musters, you feel Stubbs treats him with the same cool, analytical eye – and drops the red-coated figure into his perfect composition like the last piece of a finely cut jigsaw. 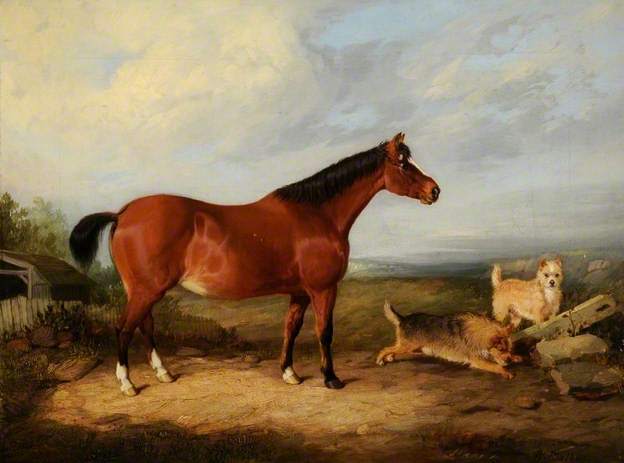 The social position of Musters and his relations with others outside the frame of the picture – the groom and the wife – are left for the assumptions of the viewer to guess; it is not for Stubbs to dissect them as he might dissect the horse. Malbon has less use for his horse. He’s perfectly competent at horse painting, as the rest of his oeuvre shows, but his main interest is in the human figure of Joseph Fenton, and his relationship with the other people in the picture. Here’s an ordinary man, not especially well-off, as his worn clothes show, but proud enough to keep a modest mount, and to treat his family and their friends to a summer Sunday meal in the meadows. He’s a family man, and the girls are clearly fond of him. The painting commemorates his humanity and ease of social relations as much as it validates his personal social standing. It seems almost like a photograph, and indeed the age of photography, with its accommodation of the informal and the democratic, was not far away. Are you quite sure of John Musters being married to Sophia? 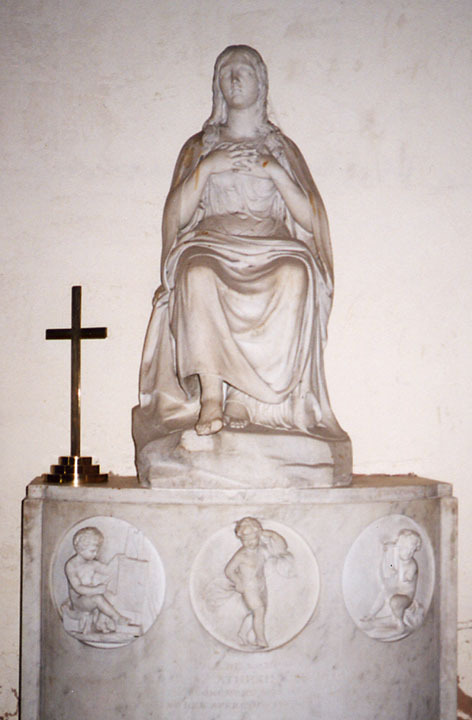 There is a memorial at Annesley Church to Sophia Musters placed by “her husband” (not named). She died in 1819 at the age of 61. Another memorial is to Mary Ann Chaworth who died in 1832 at the age of 47. Everything I have read, including the letters of Frances Rolleston, a friend of Mary Ann in youth, says that she married John Musters and from her he gained the Chaworth estate and took on the name Chaworth until relinquishing it in 1823.